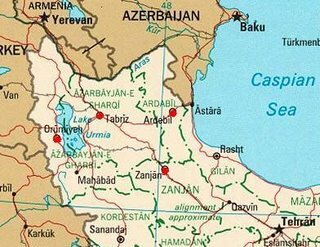 ** Update: (Saturday June 3, 2006) – Iranian Azerbaijanis are staging protest actions in Tabriz, Sulduz, Miyane, Ardabil, Urmia and Zenjan cities in Iran! 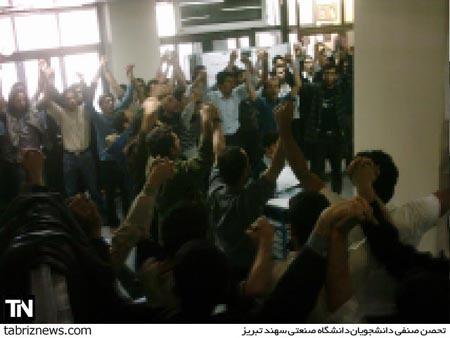 They are protesting against the Iran Daily publishing a caricature insulting entire Azerbaijanis. The Iranian authorities brought 20 thousand guards and police forces to Tabriz to disperse the protesters. The South Azerbaijan National Revival Movement (SANRM) Baku bureau spokesman Aghri Garadaghli told APA that there are about ten thousands of protesters in Tabriz. Bloody clashes started between the forces and demonstrators accompanied by firing gun. It is not ruled out that special provokers among the protesters fired gun. Garadaghli also said that Iranian law enforcement bodies are using torture on the detained Azerbaijani demonstrators making them say that the US and other Western states are behind these protests. Four protesters died of severe torture in the past two days. There was an armed clash between the Iranian military forces and the demonstrators during the protest action in Miyane city. There is no exact information about number of the killed and injured. According to the latest reports, law enforcement bodies arrested 1,700 Azerbaijani protesters in Tabriz, 1,500 in Ardabil and 1,000 in Tehran. The SANRM reports that demonstrators Ms. Hajar Sultani and Sirus Huseyninijad underwent severe torture and they are in bad health now. However, they have not been hospitalized yet. This video taken at an earlier Tabriz protest that Winston and Bir Turk Oglu posted is just amazing! The sheer number of protesters and the noise level is astounding! 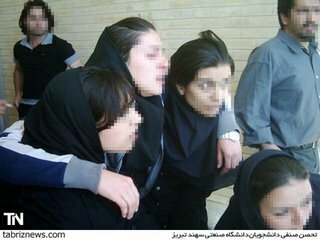 The regime sent in its repressive guard to crack down on the protesters, including the women in the crowd, in Tabriz and surrounding cities. The Iranian resistance is calling on human rights agencies, the UN, and bloggers to condemn the crimes against the Azeris and to help those arrested in the demonstrations. Winston at The Spirit of Man has links to More protest pictures from Iran! It’s not really a surprise then that the regime is confiscating phones at the protests in Tabriz. People took to the streets of central Tabriz chanting anti-regime slogans, NCRI informs. Special guards intervened to disperse the crowd but they faced stiff resistance which led to clashes in many parts. According to eye witness accounts the sound of fire arms did not stop throughout the demonstration which lasted for hours. People attacked banks and other government buildings and broke their windows. To neutralize the effect of tear gas, the young people set fire to tires on streets and clashed with the suppressive forces. Similar protests were reported in Orumieh, Naghadeh and Ardabil, major cities in Azeri speaking provinces in northwestern Iran. Security forces have been going door to door in Naghadeh in search for young people. Those found have been transferred to unknown locations. The regime is refusing to hand back corpses of those killed in Naghdadeh during riots over the past week and the lives of many wounded are threatened as they do not receive medical attention. Up to 3,000 reinforcements had to be brought in from other parts of the country, NCRI reports. 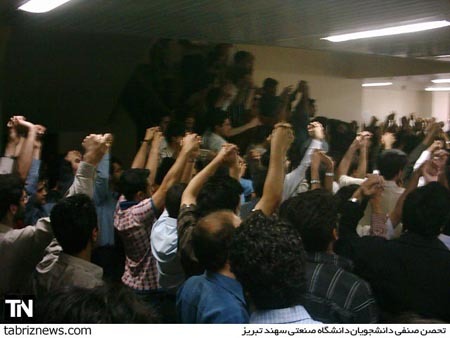 Reports from Tabriz indicate that dozens of banks and government buildings have been attacked and their windows shattered by young people in total defiance of the repressive measures enforced in the city. In one incident a woman protesting against the regime was attacked and badly beaten up by the suppressive forces before the eyes of her husband and passers-by. The government forces are taking away mobile phones with cameras in a bid to stop reports and photos leak out. Even so some pictures have been sent out with great risks. The Iranian resistance is calling on human rights agencies and the UN to condemn the crimes against the Azeris and to help those arrested in the demonstrations. Knickerbocker News has a roundup of some of the protest news this week. Stefania sends this news from Aryamehr. Publius Pundit has more on the fate of Nazanin. This Time Protesters Riot in Iran Over a Cockroach Cartoon! Tehran Universities Erupt in Violence Overnight! 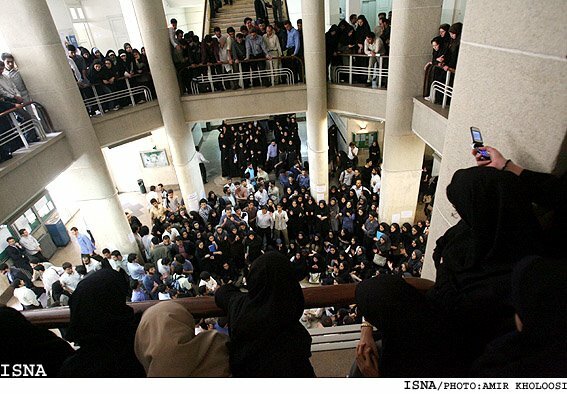 Iran: U.S. Will Fail to Provoke Ethnic Strife… Oh, Really?!! 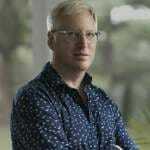 Update 2: (5:30 PM CST) Ayla who commented below ought to be happy to know that Paul at Powerline and Michael Ledeen at NRO gave Karl Vick the “voice of the mullahs” at the Washington Post a complete fisking today.